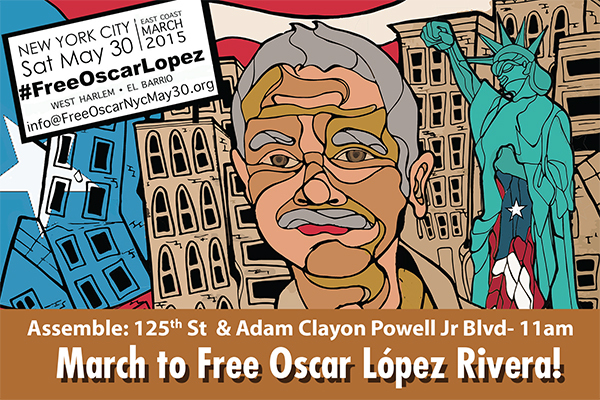 Here are THREE ways to help Oscar López Rivera. One event is in San Francisco today (Friday May. 29), another event is in New York City tomorrow (Saturday May. 30), and also today (Friday May 29) there is a nationwide call-in to Pres. Obama in the White House. Friday May 29, 5 pm till 7 pm. Market & Powell St. San Francisco, 5:00 P.M. until 7:00 P.M. Call President Obama at 202-456-1111 and leave a message! Let him know that Oscar López Rivera has been in prison for too long and deserves to go home. We need to flood the voice mail with our united demands for freedom. President Obama, I ask that you free Puerto Rican Political Prisoner, Oscar López Rivera. Since 1981, he has been in jail for fighting for Puerto Rican independence; he never committed a violent crime and has been a model prisoner. I ask that you follow in the foot steps of Presidents Truman, Carter, and Clinton, who freed other Puerto Rican activists, and set Oscar free. ← Over 400 people jammed into the BookMark bookstore ! Click on the above link to watch a video about this project. Our partner, reporter and political activist Edwin Chungo Molina is promoting an interesting campaign to force the United States (US) government to release Puerto Rican political prisoner Oscar López Rivera. Oscar has served 34 years in a US prison for exercising his inalienable right to use all means necessary to decolonize Puerto Rico. The US government is the criminal for ignoring 34 United Nations (UN) resolutions asking it to immediately decolonize Puerto Rico. In 1960, the UN determined democratically that colonialism is a crime against humanity because it threatens world peace. The fact that the US government refuses to release Oscar despite overwhelming local and international support is evidence that it wants to keep Puerto Rico as its colony forever! United Partners for Puerto Rico Decolonization joins InformacionAlDesnudo in this project of permanent mobilization in all of Puerto Rico’s 78 town squares to protest for Oscar’s release. Starting on January 29, 2016, we will be at the Bayamón Town Square from 2 to 4 PM to begin our permanent and peaceful protest. Join us, and bring your flags and signs to increase the pressure to the necessary level that will force this government to listen to the people like it is supposed to do in a democracy! Wanting to be Free from the United States of America…….Should not be a crime. Free Oscar Lopez Rivera ….. longest held political prisoner. His “crime”: wanting his country to be free! !